How long have you been thinking about investing in manufacturing software? Do you have your finger on the button and just need that last bit of evidence to press “GO?” Successful shop owners know that holding a balance between inventory, production costs and customer service is the key to a profitable business. So, how can your shop be one of those? Maybe knowing the potential ERP Software ROI may get you to that “GO” button faster. As all savvy business owners know, any investment is only valuable if you can track and see a positive return over time. So, what are some ways you can see this potential ROI? Read on for the evidence! There are both tangible ways (dollars and cents) and intangible ways (reduced waste and access to valuable data) to consider when measuring if an enterprise resource planning (ERP) system is a good investment for your company. Let’s start off with the tangible. Dollars and cents can usually prove beyond a doubt how valuable any investment can be. Let’s say you are paying an employee to spend 4 hours a week on customer service functions such as tracking job status, re-keying repeat job orders and re-keying materials for purchase. 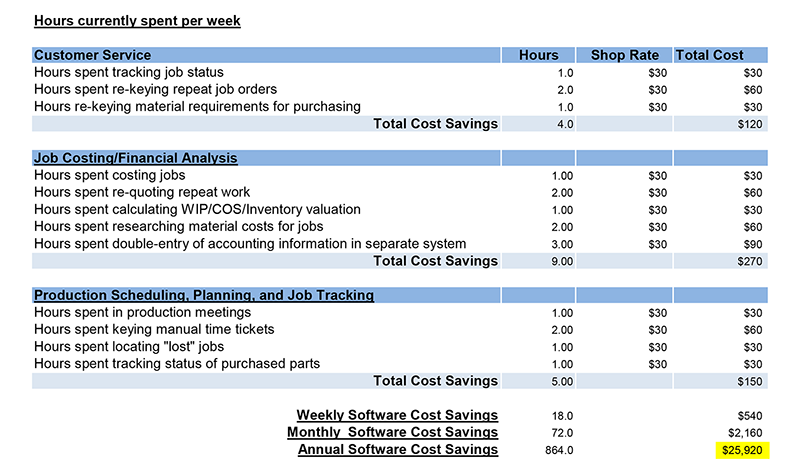 Another employee spends 9 hours a week on financial analysis — things like re-quoting, researching material costs and time spent on double-entry of accounting information in a separate system. Add on another 5 hours for scheduling and planning such as tracking purchased parts status, keying manual time tickets and time spent locating those elusive “lost” jobs. That totals 18 hours a week of manual functions that many ERP systems, like E2 automatically perform. If you bill on average of $30/hour, that’s a monthly cost of $2,160 with a yearly cost of $25,920. Those numbers could be SAVINGS for your company, not costs. Depending on your own numbers, the software could pay for itself in a matter of months, if not weeks. Not to mention, the time saved doing these manual functions and repeat work can be time spent on other important projects or jobs. While dollar signs shout out loud to some as the end-all proof that an ERP system or a manufacturing software solution is a valuable investment, sometimes the intangible benefits speak a little softer, although still with undeniable proof. Having an integrated solution that touches your entire business can be a powerful ally when determining the future goals of your company. With access to detailed information and real-time data at your fingertips, you have more power to make decisions with confidence about staff, costs and infrastructure you probably didn’t have prior to a solid manufacturing software solution. The frustration of having multiple operation software systems that don’t talk to each other is gone and replaced with an ever-updating system that advances with changing technology. Along with streamlining processes and productivity improvements, your shop’s competitive advantages can increase beyond what might be measurable by hard numbers. With potential reductions in purchasing costs, staff and paperwork, your shop’s time might be better spent on marketing your products, concentrating on new sales or investing in shop equipment. 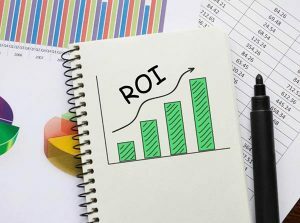 The intangible ROI benefits could be more impactful than you can imagine. So, is your finger getting closer to pushing the proverbial “GO” button? Running some numbers and evaluating immediate and potential benefits may just give you the proof you need to make the investment today in the right ERP solution for your business!